PikaBelleChu is most well known in the anime world for her continuing passion for Pokemon.She has appeared in many magazines and newspapers such as Nintendo Power, Animerica, Anime Insider, Pokemon Fan, Beckett Pokemon Collector, VW Trends, EGM, Star Banner, Riverland News, St. Augustine Record and the highest achievement of being featured in the Gamers Edition of Guinness Book of World Records 2009 for having the Worlds Largest Pokemon Collection in the World, with over 8,000 items from American to Japanese collectibles and including the official Pikachu Volkswagen you can see displayed at many conventions she attends. She does numerous Pokemon events, childrens events, car shows, parades and appears at conventions world wide for her dedication to Pokemon. 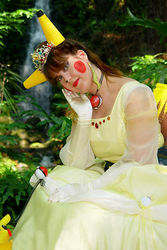 Also a cosplayer she has created more then 80 costumes mostly consisting of Pokemon and her own special creations called Pokewomon Princesses where she takes a Pokemon and creates a royal version of that Pokemon, some costumes taking more then 3 months to create. When not promoting Pokemon and cosplaying for events for children she also teaches kids cartooning at local craft stores and paints murals in businesses and private homes where she lives.